Please read to the bottom to download your free Cursive Mastery Workbook (15+ page PDF). Chances are that if you look at any birthday cards or handwritten letters from your parents' or grandparents' generation, you'll find that their handwriting rocked! So what happened? Why does handwriting come so hard for modern generations? 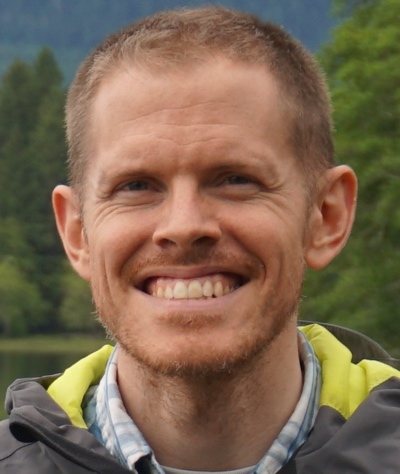 Are we simply seeing the results of a computer and cell-phone-dependent society, where typing, texting, and now voice-assistants are so are dominant? Or is there something else going on? It would be foolish to say that the modern onslaught of tech devices has had zero effect on our society's handwriting abilities- of course it does. It's obvious that the less time we spend writing with pen and paper, the less skilled we are at handwriting. It only makes sense. And conversly, the more we practice something (the right way) the better we get... usually. But this is not the only reason why handwriting skills are on the decline. It's a little known fact that before the 1920's, children were first taught to write in cursive! That's right, cursive came before manuscript. And it so happens that there are many built-in benefits for cursive-first instruction. Manuscript is a better option than cursive. Well, if all we are looking for is signs of quick progress at the beginning, or think that book typography and handwritten letters must be nearly identical in order to avoid confusion, then yes! it might be better to start off down that path. Sadly, taking the shortcuts of print-first handwriting has led countless souls to the destination called "Scribble-dee-scratch-dum." Which is known for causing severe conditions, like "Chicken-scratch-itis," "floating-letter-lepsis" and "Hand-cramp-athy." All, fake names, describing very real problems. Direction: Cursive re-enforces the correct left-to-right direction for reading and writing. You start at the left and move in an unbroken line to the right. 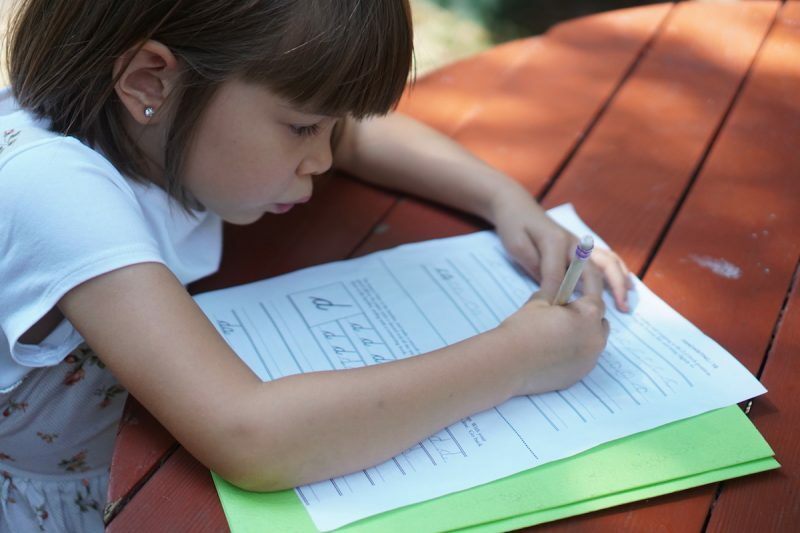 Speed and Sustainability: The writing of connected letters creates a rhythm, allowing children to write faster, and continuously, without always having to lift the pencil off of the paper. The decreased lifting up and putting down of the pencil to the paper also means your child can write longer before hand and finger fatigue set in. Spacing: Cursive helps beginners learn to evenly space the letters, because they are joined in each word by a connecting line. Easier Transition: Cursive, once mastered, will make learning print much easier. It's not so, the other way. Elegant: Cursive just looks better (Hello, John Hancock and the Declaration of Independence, Sa-weet! ), and it helps increase a child's sense of achievement. It's not enough to just teach your child cursive. There are other things that will really help them to succeed in their handwriting. Pencil and pen grip- Fingers should be slightly arched, and not tight while holding the pencil. The pencil rests on the thumb, with the index finger on top, and resting on the inside of the last section of middle finger. Pens and pencils should protrude 1 inch from finger tips to allow for visibility on the writing surface. Paper handling and angle- Paper edge should be parallel to the outside edge of child's writing arm. Gently hold paper at the corner using the non-writing hand. Body posture- Back should be straight, with feet flat on the ground, and head slightly tilted toward paper. If we allow our children to start writing in whatever position they feel comfortable, then we're setting them up for life-long writing fatigue. If we want to cultivate strong literacy skills, and a love of writing in our children, then it needs to be an enjoyable experience. That's why things as simple and often overlooked like posture, paper, and grip are so important. The best way to create good habits in each of these areas is to practice a little bit each day. By doing this, your child will develope the long-term muscle memory needed for efficient, accurate, and consistent handwriting. But that's also why it's so important to teach your child to write with the correct form, from the very beginning. Think of your child's writing skills as cement: it settles fast! Make sure the form is in place before you ask them to "pour out" the letters. Practice only makes perfect when you practice perfectly. Take your time. Focus on your child's posture, paper handling, and pencil grip. Go slowly at first. And then when they can consistently produce their letters with excellence, they will naturally increase their writing speed. I just finished creating a new resource to help you teach your child to write lowercase cursive letters. It covers the correct pencil grip and hand posture, as well as giving dictated instructions for creating each of the 26 letters. This is a great primer for handwriting practice. Please check it out and let me know what you think! Start Teaching Your Child Cursive Today! 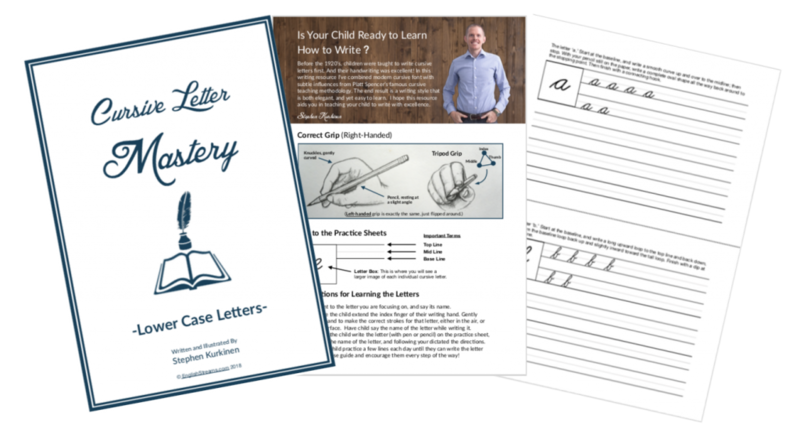 Subscribe to my newsletter and get a free download of my latest resource "Cursive Letter Mastery." Would This Help Someone You Know? Please Share!